These chefs aren’t afraid to get their hands dirty. It doesn’t get any more local than walking outside the restaurant and snipping some lettuce or herbs to add to a dish or drink. While some chefs are out on the farm, others are planting right outside their restaurant doors. For these local chefs, growing their own produce is a point of pride. The goal remains the same, it’s all about respecting the whole process from seed to plant. 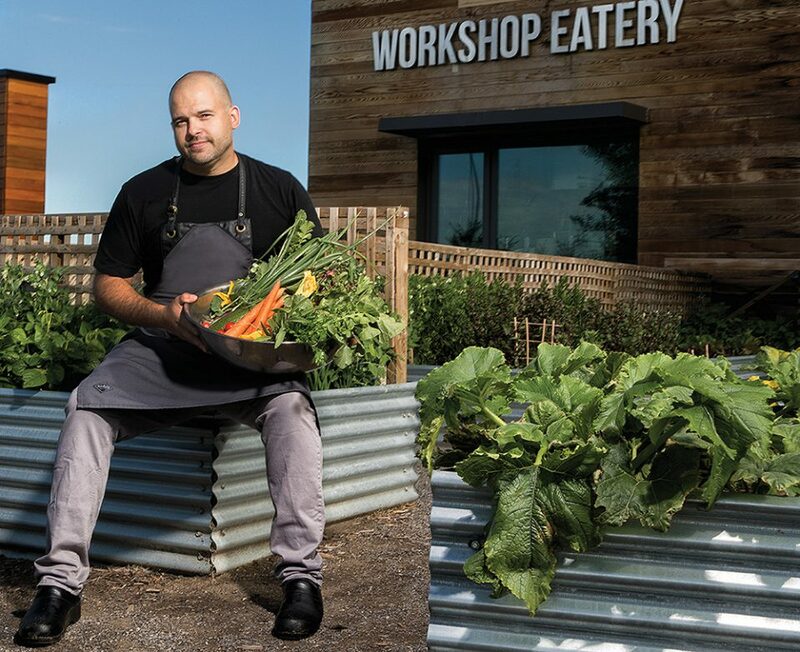 At Workshop Eatery, chef and owner Paul Shufelt creates many of his dishes around what’s sprouting in the restaurant’s garden. Shufelt has 13 garden boxes that amount to about 750 square feet of garden space. Shufelt says he likes growing some of his own produce for the restaurant for several reasons. Workshop Eatery grows staples such as heirloom carrots, beets, tomatoes, fresh herbs and edible flowers. However, this year Shufelt is trying cucamelons and more diverse herbs such as sorrel, lemon thyme and different rosemary varieties. As if running the kitchen at Cafe Linnea isn’t busy enough, chef Kelsey Johnson has added farming to her to-do list. Last winter, Johnson took over an acre of land on a family friend’s farm north of Edmonton. She had to break the land and till all the soil herself. Johnson says there’s been a lot of trial and error. Johnson and her team work to utilize every part of the product that’s harvested – right down to carrot and beet tops. Thinking outside the box and having less waste can be small steps towards sustainability. Carrot peels are usually composted or are thrown away, so why not fry them for some crunch on top of a dish? Ben Staley was co-owner of the The Alder Room, which closed in August. He is looking for new partners to re-launch the restaurant. He takes a somewhat different approach to the way he sources local produce. Staley exchanges farm labour for top produce picks at Vesta Gardens, where he’s known owner Deb Krause for five years, in order to have more control over the products he’s using and to be more involved with the growing process. “I really enjoy being at the farm. So many cooks are far removed from where their food comes from and don’t understand the amount of work that goes into growing different products,” Staley says. When you are fully involved in the growing stages until harvest, you get to challenge your own creativity. “We can switch the menu whenever we want. What’s growing at the farm or what’s in season allows us to create new and exciting dishes,” Staley explains. Over at Three Boars, chef and co-owner Brayden Kozak and his team built the restaurant’s first couple garden boxes in 2013 and have expanded from there. They plant carrots, potatoes, radishes and also like to grow higher turn-over products such as mustard greens and other baby brassica. There is one garden box that’s dedicated strictly for herbs such as different varieties of sage, mint, thyme and chives. “We also typically dedicate one box to experiments, growing different things we haven’t tried. The greens we grow are typically spicy and great for garnishing dishes and the herbs get used a lot in the bar during the summer,” Kozak says.